Our appointment was at 2.30 and we got there just in time. Just in time to be shown the waiting room and sit there. For ages. But while we where there we spotted Jill as she left, and wound up sat next to Esther - who runs Kitten Fever and did my pre-hen-party-party - with only 2 weeks to go before her baby is due. So that's another one to add to the tally! Baby Boom!!! Eventully got called and had my blood pressure cheked. That's ok. And my pee. Slight infection there so I have to antibioltics for that, no biggie. Then we got room shuffled a couple of times and eventually got seen by the consultant and a medical student. 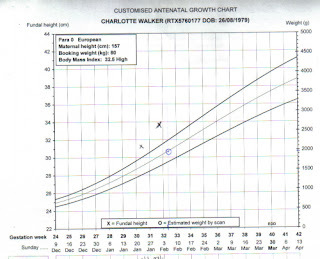 The both measured by fundus and the baby and it measured 35cm, which is still a good 3 weeks or so bigger than we are. So we were sent for a scan. This meant another long wait. Yorkie was itching for a smoke, but went and found me some food instead as I hadn't eaten since breakfast, bless him. Eventually got called for the scan and we got to see Wiggle again *SO HAPPY* Wiggle is now lying head down, bum up, as it ought to be. We caught a glimps of baby's face, but not a good one as the cord was blocking the view, and Wiggle was sucking on a foot... So we opted for just the one photo as we were told what was what, but you can't really see anything if you don't have it explained first. Next we had to wait to see the consultant again to find out what the scan showed up. 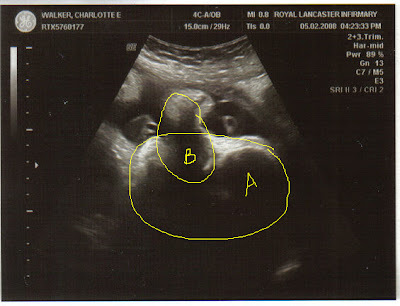 And it showed that baby is NOT over sized, infact baby is spot on the right size for it's age. And I mean SPOT ON! Very impressed! (must mean it's just my belly that's fat then, lol). We were given my script for my antibiotics and sent off to the hospital pharmascy, the only place I can use the script. Only now it's 4.30... and that's when it shuts! So we rang the bell and crossed our fingers and eventually we were let in and left waiting 15 mins for the pills boxing and handing over. At around 5.30 we finally managed to get home... forget the shopping we were going to do, and forget the trip to the cinema. I'm shattered! So it's frozen pizza for tea and an early night for me. Still, baby is happy, healthy, and (aside from the foot suckin) not a freak. Which is all I wanted to know. YAY!